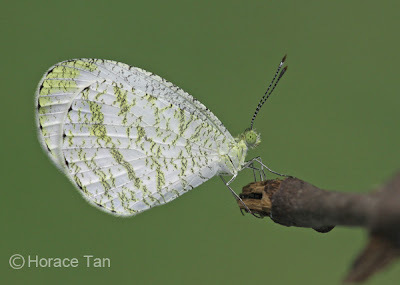 The short month of February is almost coming to an end, and the rainy weather that kept many a butterfly photographer in Singapore cooped up at home is also changing for sunny humid days. 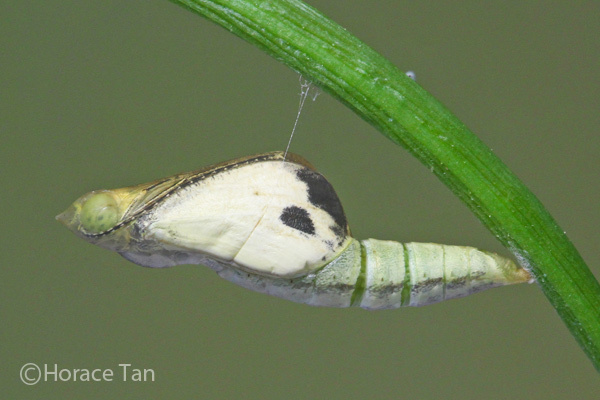 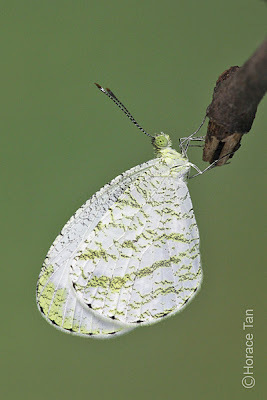 It will be butterfly season again soon, and members of ButterflyCircle started the year with great excitement, recording two new species to the Singapore Checklist - the Malay Dartlet and the White Banded Flat, and just as this article is being prepared, at least 2 other species have been observed! 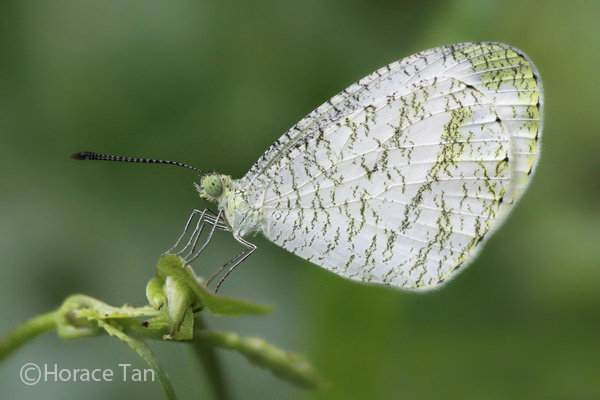 Singapore, the Little Red Dot at the end of the Malay Peninsula, is thus far blessed with protection from natural disasters like earthquakes and typhoons. 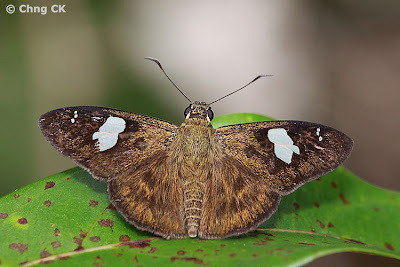 Even the 2004 tsunami, considered the deadliest tsunami in history, spared Singapore because of its location where it was shielded by Sumatra and Malaysia. 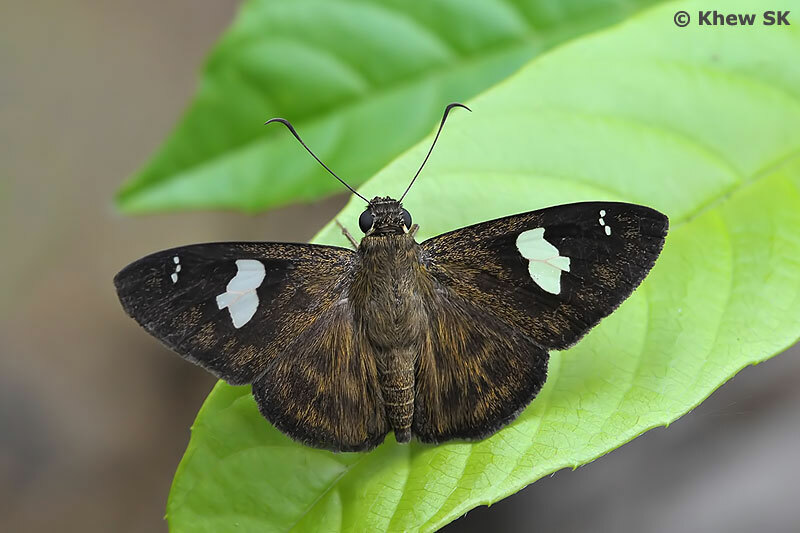 The deadly tsunami, which was triggered by a 9.0 Richter scale quake which had its epicentre in the Indian Ocean near the west coast of Sumatra, killed at least 150,000 people across 11 countries and made millions homeless. And yet, Singapore was spared from the killer waves, despite its proximity to Sumatra. The month of February, which is also the month in which I was born in 1959, is usually associated with the gemstone Amethyst. 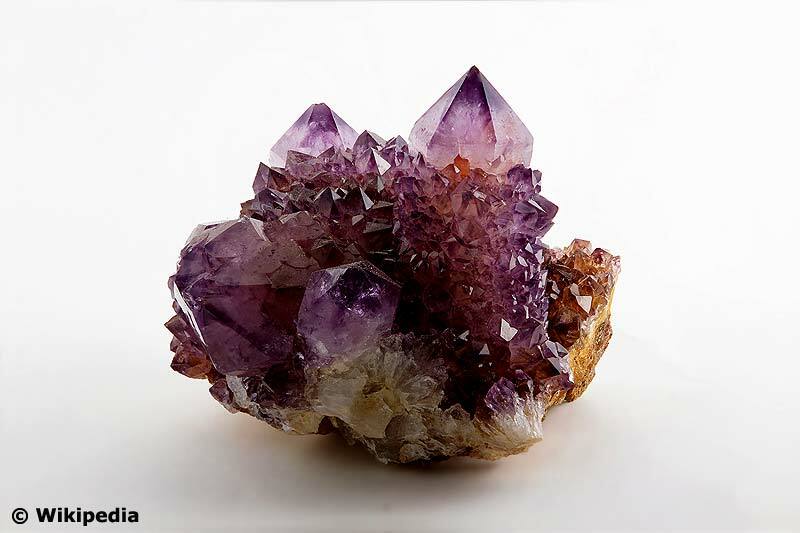 This gemstone is a purple-violet variety of quartz and ancient civilisations believed that the stone protected its owner from drunkenness! 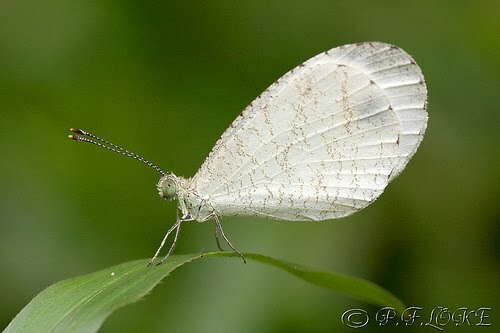 They were also believed to heal people and keep them cool-headed. Amethyst is usually associated with the colour purple and is the birthstone for the month of February. 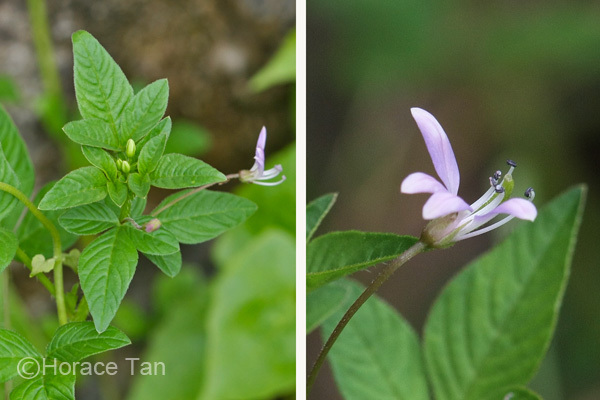 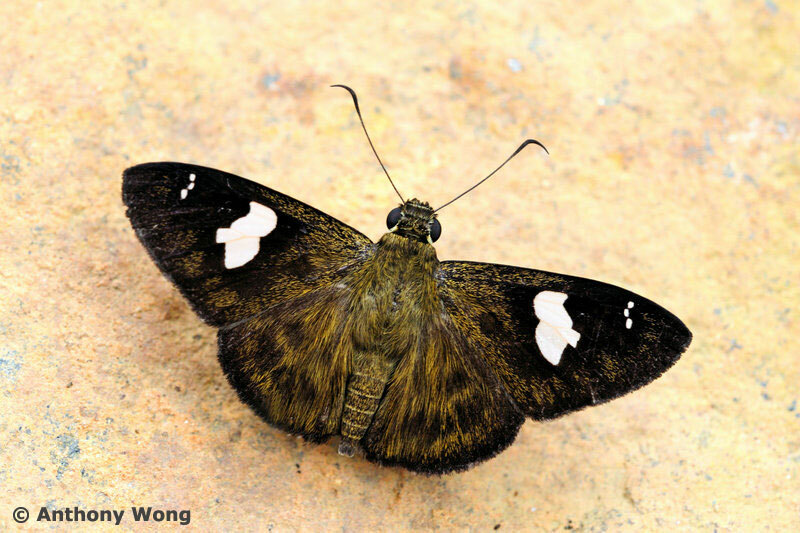 This month, we feature a Singapore butterfly with purple in its common name - the Purple Duke (Eulaceura osteria kumana). 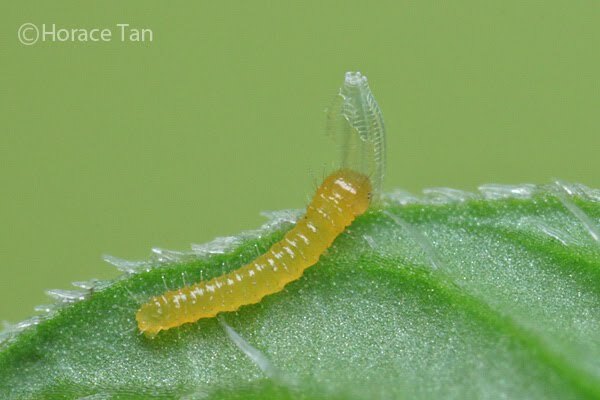 This species belongs to the subfamily Apaturinae, of which there are only two species found in Singapore. 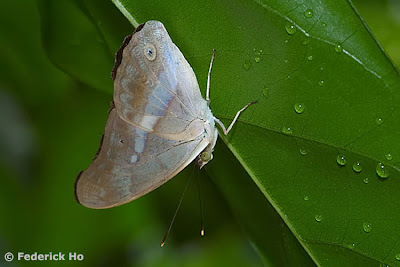 It is the sole representative of its genus in Singapore. The male is pale purple brown above with a white discal band increasing in width from the forewing to mid-tornal area of the hindwing. 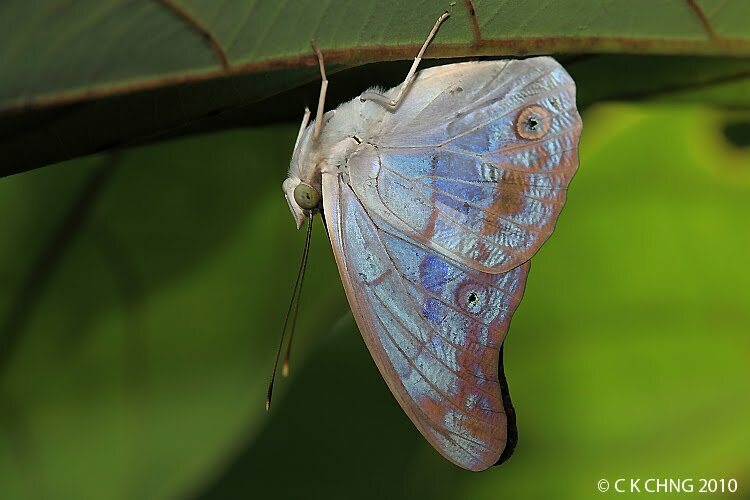 The underside is tinged bluish-violet in a side light, and features ocelli in the sub-tornal area of both wings. 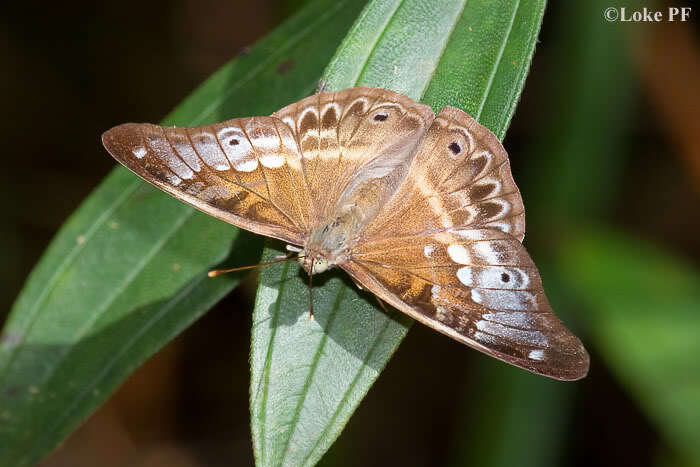 The female is dull ochreous brown with obscure white markings on both wings. 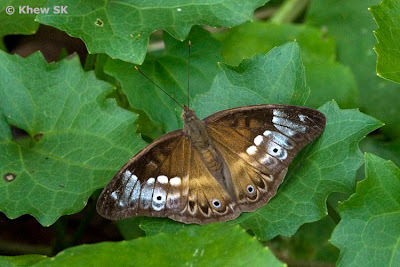 In flight the female resembles one of the females of the Euthalia or Tanaecia species. 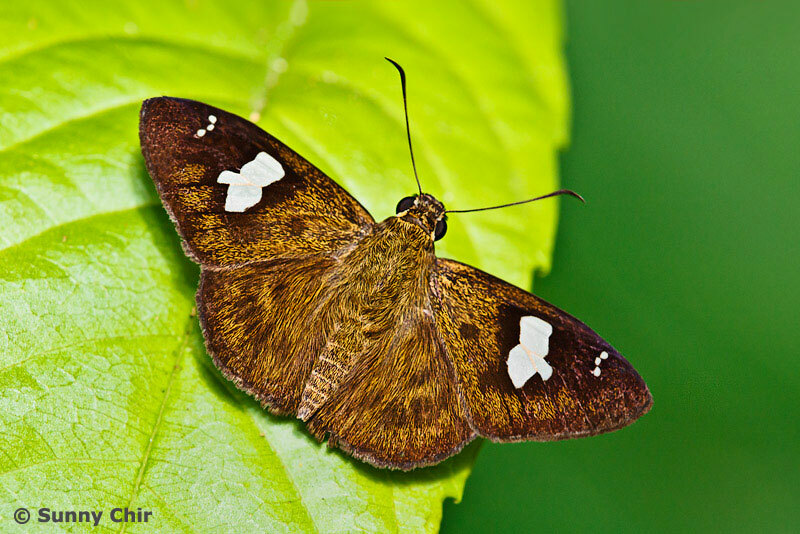 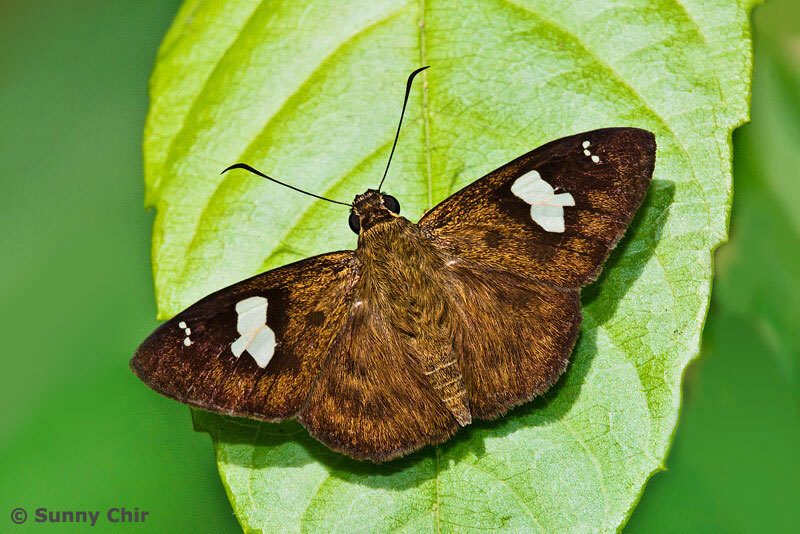 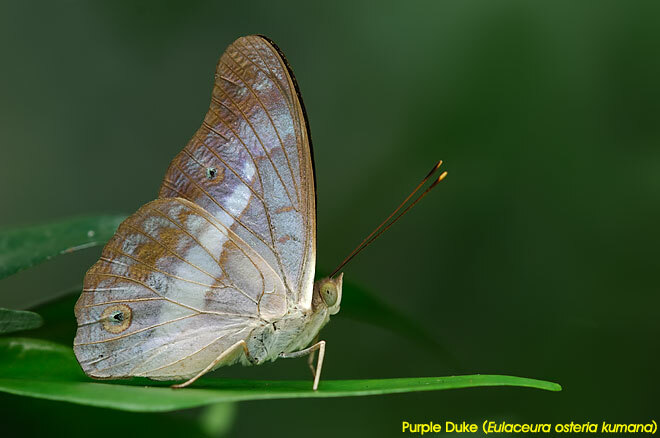 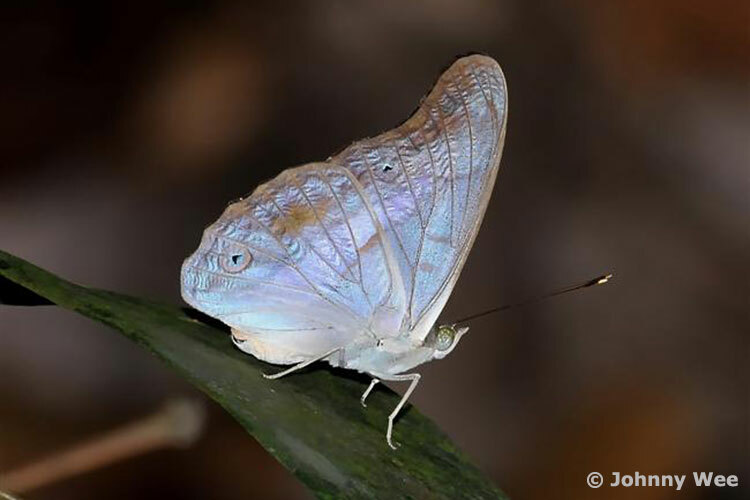 The Purple Duke is a forest-dependent butterfly, and is not found outside the nature reserves of Singapore. It prefers shaded habitats in the forest understorey, and rarely leaves the safety of the forests. The butterfly can be seasonally common, where up to half a dozen or more individuals can be seen flying around low shrubbery amongst shaded forest paths. It has a rapid flight and zips from perch to perch quickly. 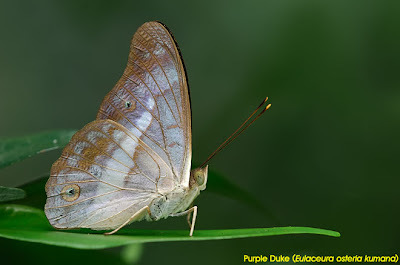 Both sexes of the Purple Duke have a unique habit of flying rapidly from its perch and settles on the undersides of leaves. 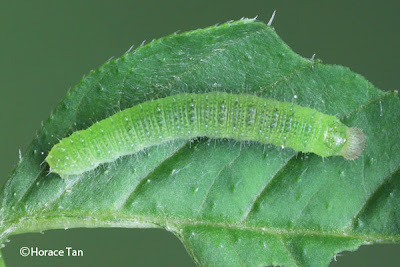 If disturbed, it will take off and zips under another leaf to hide. There are occasions, however, that the butterfly perches on the uppersides of leaves and occasionally open its wings flat to sunbathe, especially in the cool morning hours when the sun is just beginning to warm up the environment. 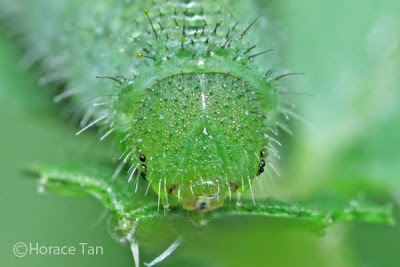 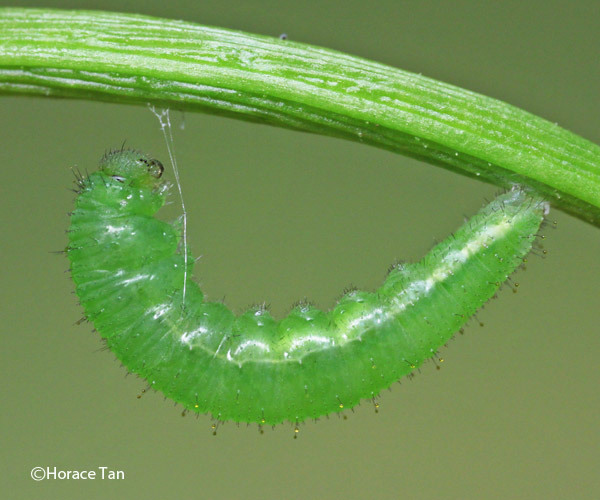 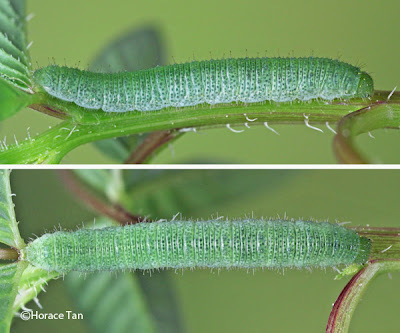 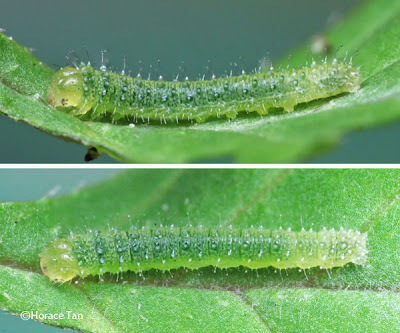 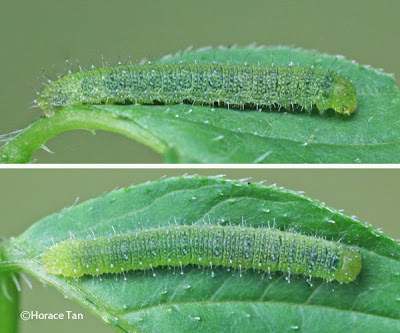 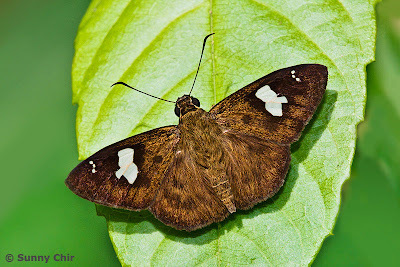 The Purple Duke's caterpillar host plant is a common forest plant, Gironniera nervosa, which is shares with another butterfly species, the Grey Sailor. 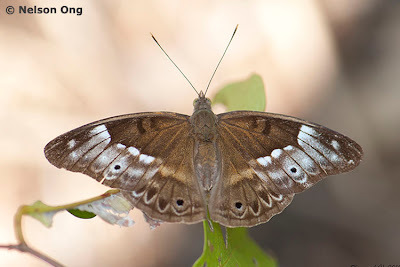 The early stages of the Purple Duke has been recorded in Singapore and can be found on an earlier blog article here. 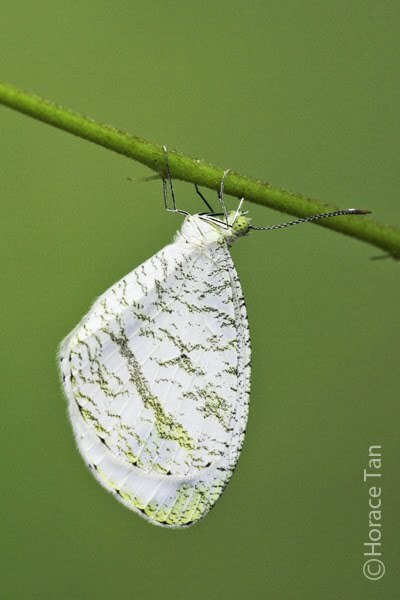 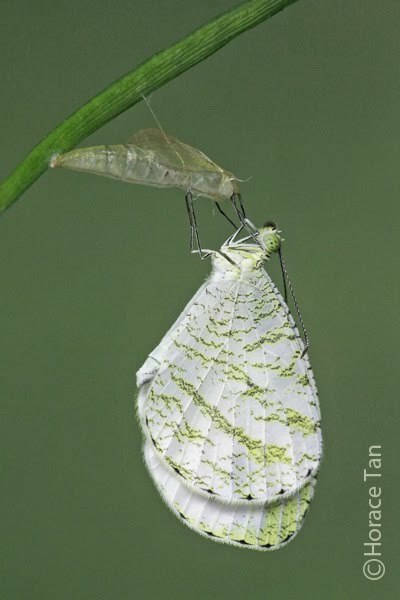 And so we end this 28-day February in the year 2011 as we look forward to the remaining months of the year with exciting new butterfly discoveries for Singapore! 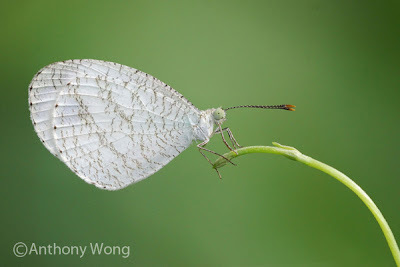 It was on one of their regular butterfly-shooting outings that ButterflyCircle members Nelson Ong and Yiming decided to take a different route to explore areas that they had not ventured before. 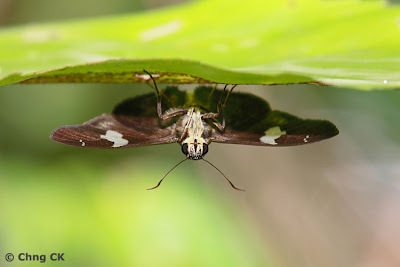 The intention was to hopefully find something new and unrecorded. Their sense of adventure and pioneering spirit was rewarded with the sighting and a few shots of a species that was extant in Singapore in the early authors' checklist, but has not been seen in recent years. What was interesting, was that they didn't just chance upon only one individual of this species, the White Banded Flat (Celaenorrhinus asmara asmara), but stumbled on a small colony of them! 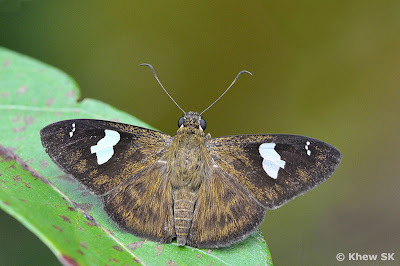 The skippers were observed zipping up and down a forested path, and dogfighting with other individuals of the same species, as well as other Hesperiidae species. 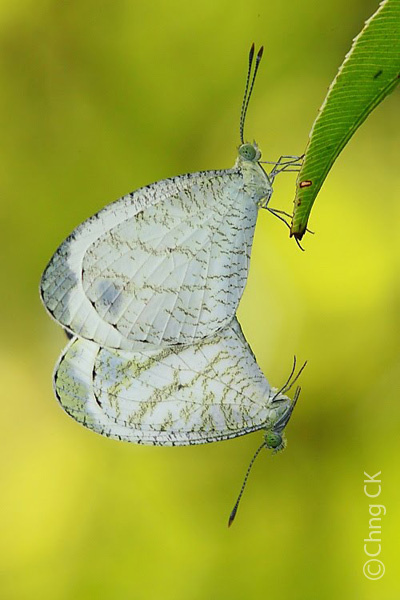 After the sighting was reported, another group of ButterflyCircle members headed for the location and observed the same behaviour in the colony of the species. 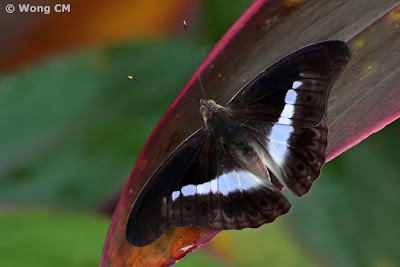 At certain times of the day, the White Banded Flats were observed stopping and sunbathing on the top surfaces of leaves, almost repeating a fixed routine where they fly rapidly, and then returning to the a favourite perch to sunbathe. 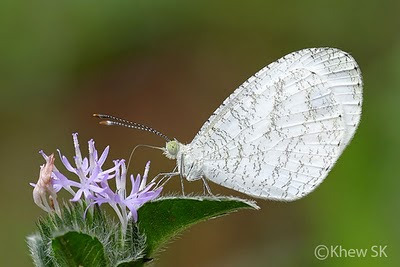 Occasionally, they even stop on rocks in the same manner, and one even stopped on one of the photographer's camera flash, as if to check out the intruders into their territory! 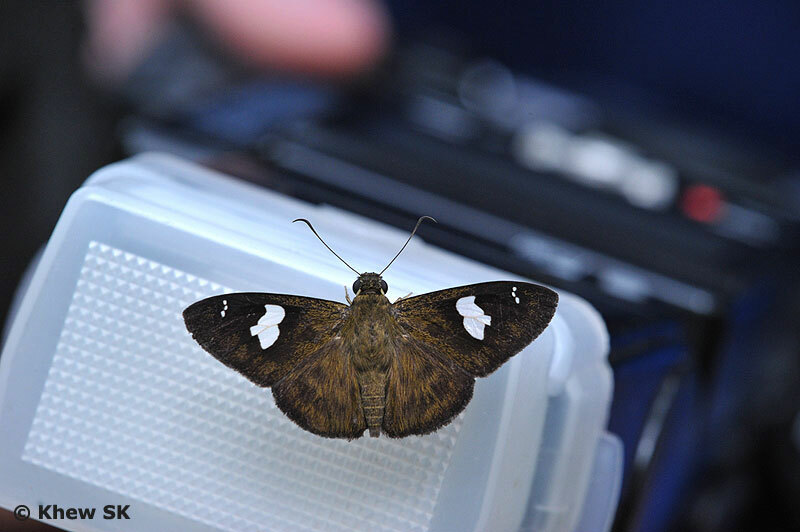 However, this behaviour appeared to be just for sunbathing and resting after their rapid flight. None of them were observed to be feeding on the leaves or perches, as their proboscis were not extended for feeding. 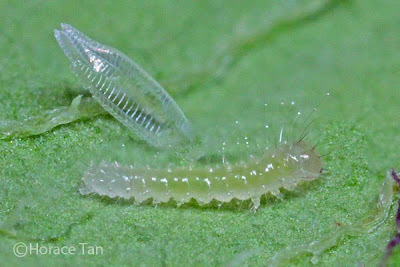 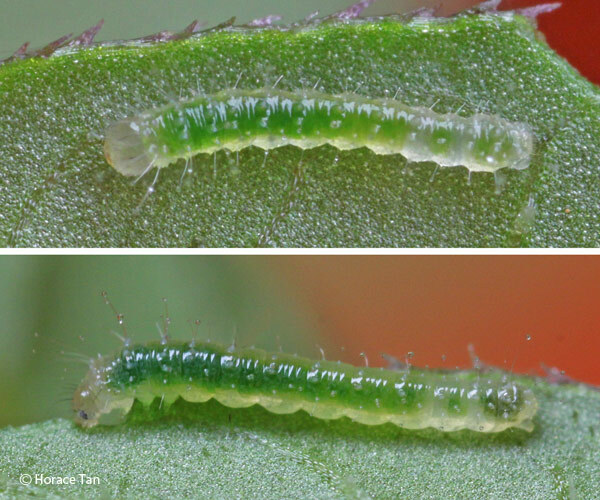 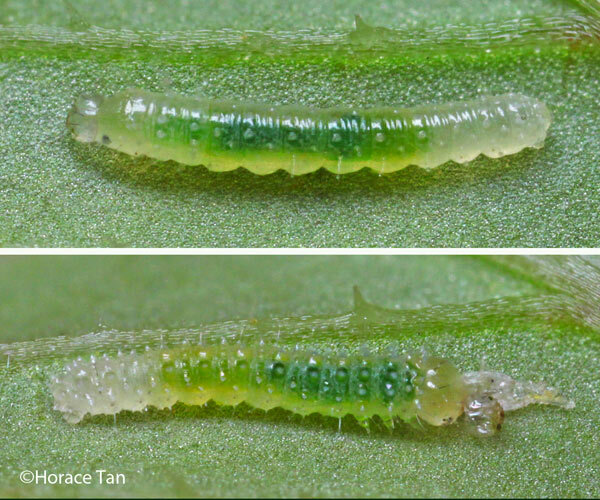 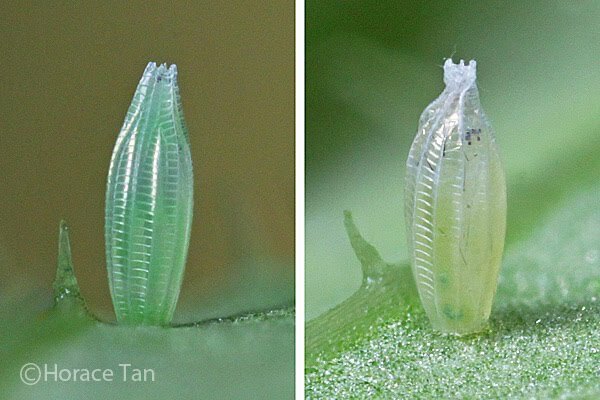 After a period of time, they reverted to the typical behaviour of the subfamily Pyrginae (Flats) whereby they stop on the undersides of leaves with their wings opened flat. Further visits and observations indicated that there was at least half a dozen or more individuals of this species in that location. However, after a period of activity and chasing each other in rapid bursts of active flight, the butterflies abruptly disappeared mysteriously altogether! This observation is quite consistent with some species of the subfamily Pyrginae, where their active period during the day is very time-sensitive, almost like clockwork, and then beyond their magical "hour" (sometimes longer, sometimes shorter), they will mysteriously disappear suddenly, only to appear at the same time and location the following day, over a period of time. The White Banded Flat belongs to the genus Celaenorrhinus, which occurs in the tropics of Asia, Africa and America. Some 80 species are known to exist, although only 10 are recorded in Malaysia. 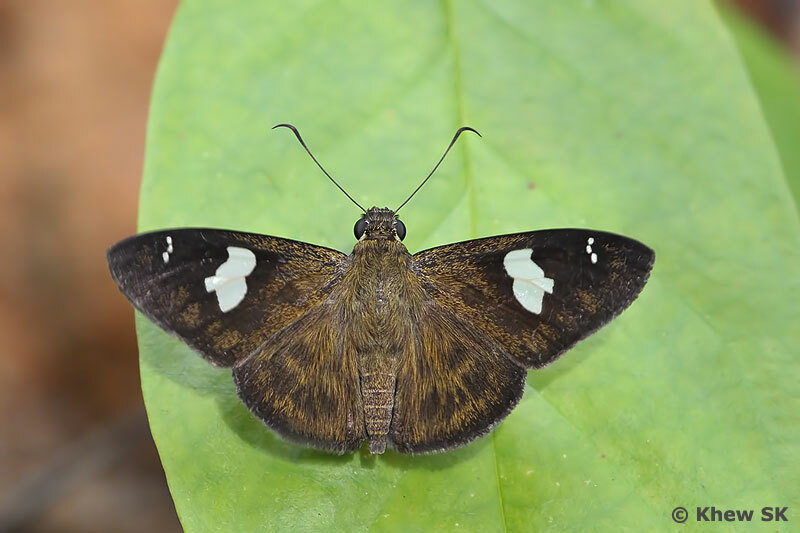 In the reference checklist (Ref : Corbet & Pendlebury), one species, C. asmara asmara was recorded in Singapore. However, until this recent re-discovery, the species has not been seen in Singapore over the past two decades or more. 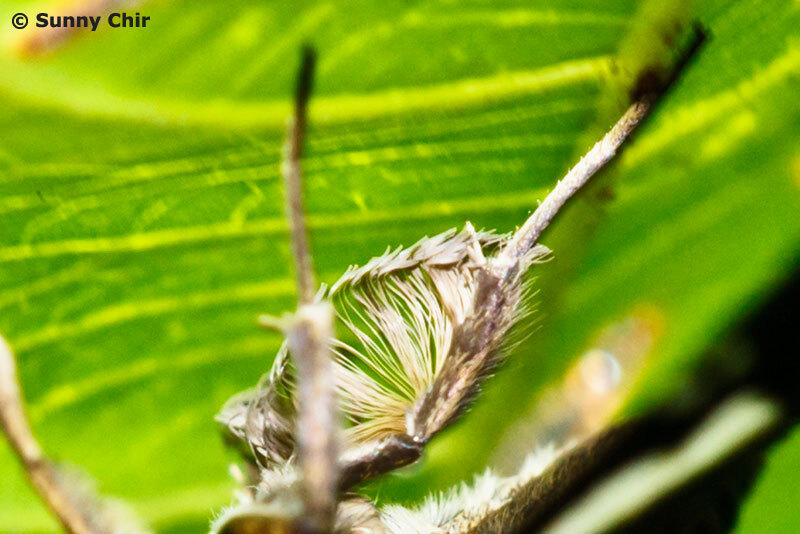 The males of the species in the genus have erectile hair tuft on the hind tibia which gives the legs a rather hairy and unique appearance. 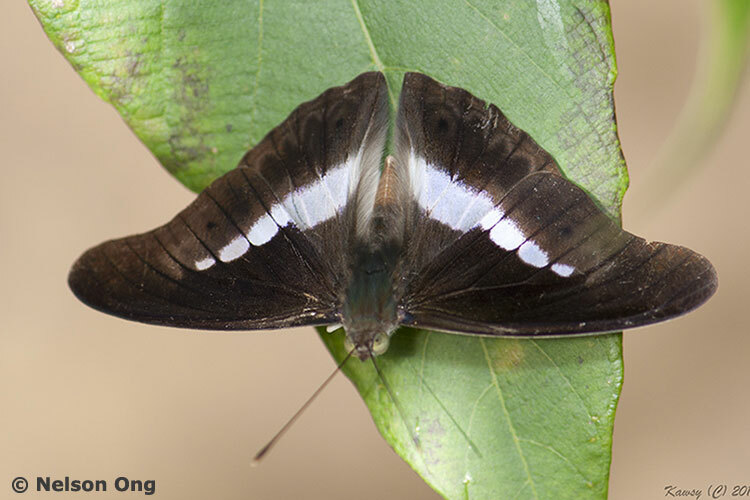 The White Banded Flat has been described as uncommon but widely distributed in the lowlands of Malaysia. 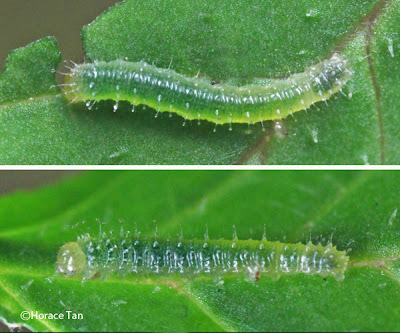 On the forewing above, the forewing cell spot is not continued above the radius and there is no white spot in cell 1b. 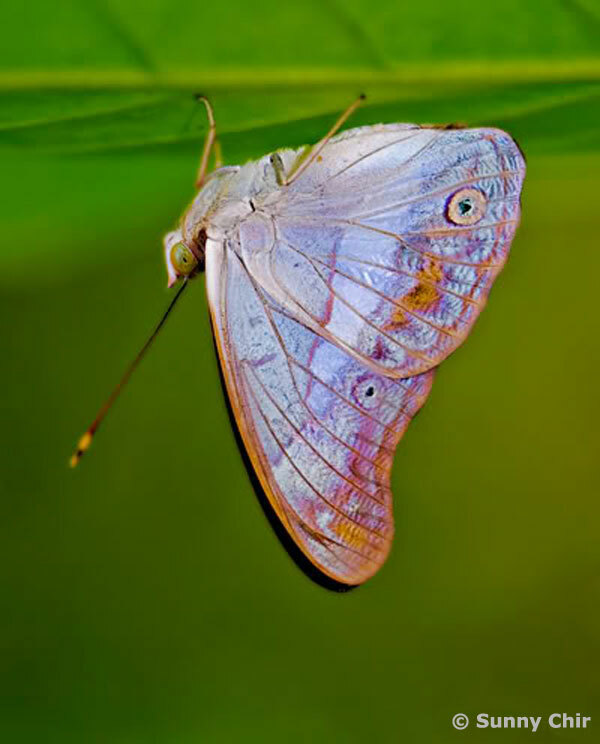 The discal fascia is white and does not extend below vein 2. 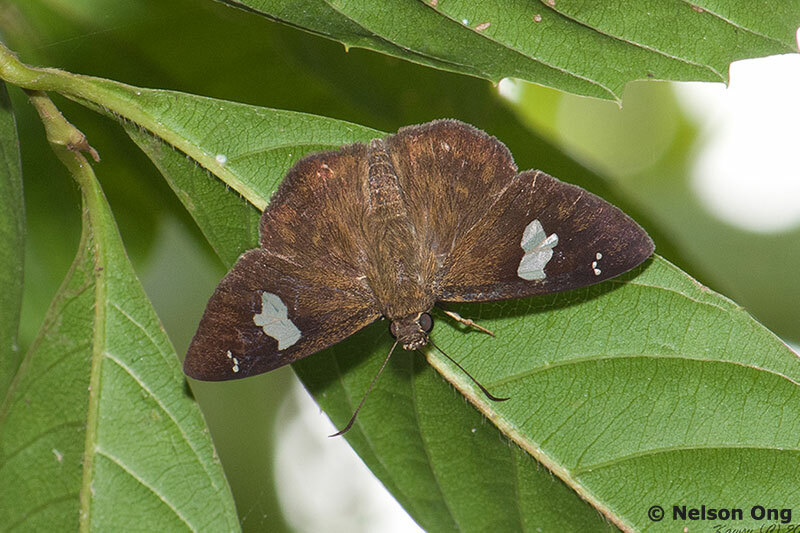 There are some obscure darker brown markings on the hindwings above. The host plant is Clerodendrum fragrans. 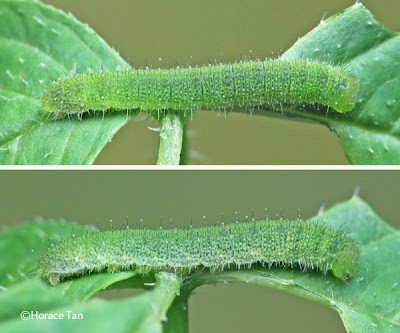 The caterpillar is described as stout with a short neck and a lustrous black head. 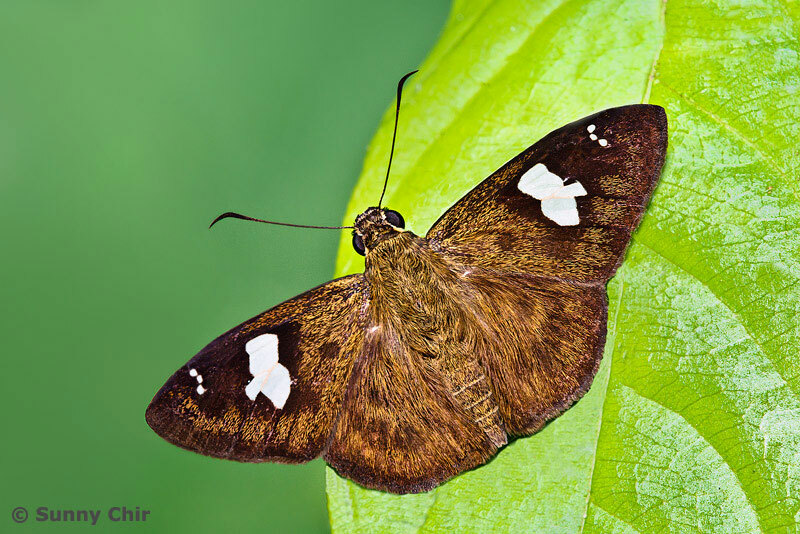 It is also noteworthy that the scientific name of the species comes from the Malay word asmara which means "romance or love". 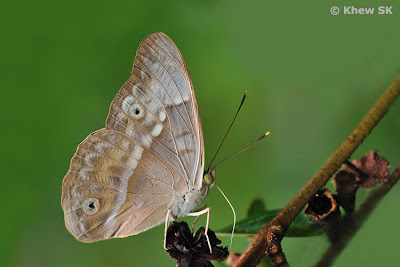 Whether Butler intended the name of this species to have been derived from the Malay word when he described this species back in 1879 is a subject for further investigation. 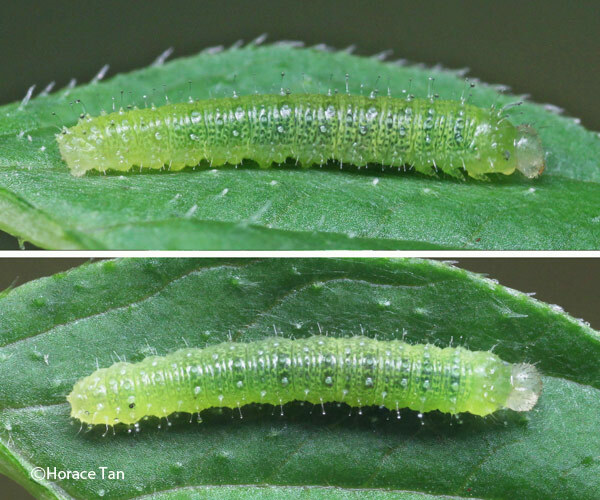 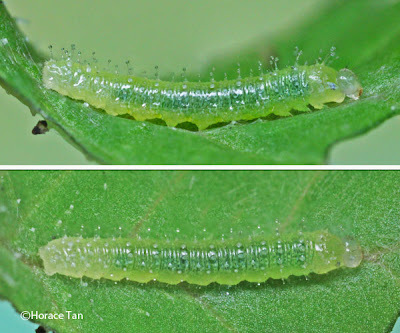 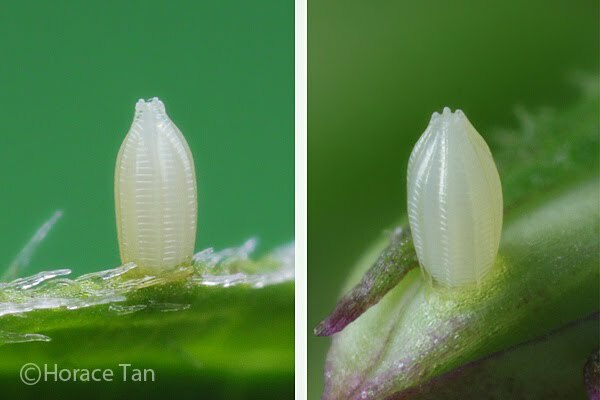 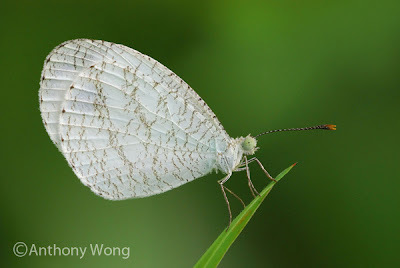 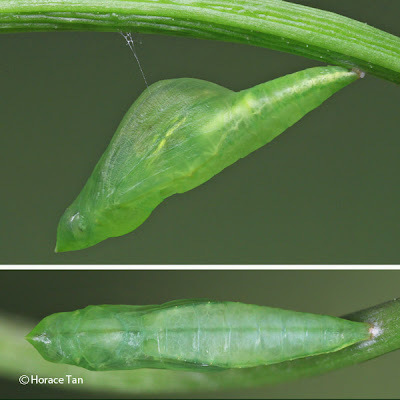 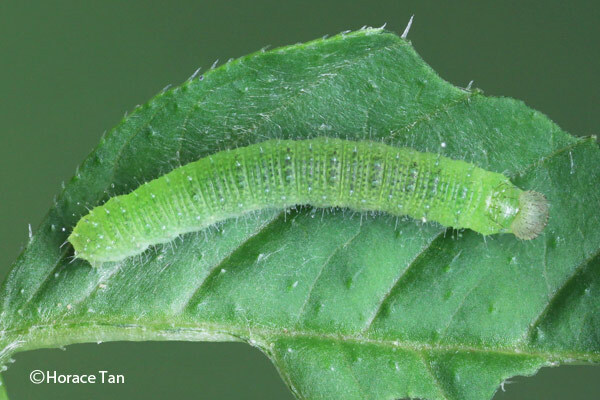 With this re-discovery, credited to ButterflyCircle members Nelson and Yiming, the Singapore Butterfly checklist edges closer to the 300 mark as we record this as species #298.